I remember back in 1985 when Tom Galley, the brother of Whitesnake guitarist Mel Galley, released his first Phenomena album. The album wasn’t a huge hit sales wise, but I remember me and my friends just couldn’t stop listening to it. Galley didn’t play anything on the album (or on any other Phenomena album, for that matter), but worked as a conductor, producer and song writer. He was the one who hired all the professional musicians for the album. That CD (or LP, which was the case back then) featured Glenn Hughes on lead vocals and the album is now considered a classic by rock fans around the globe. It was also Hughes big comeback, an album that gave Hughes the job with both Gary Moore and Tony Iommi’s Black Sabbath, both jobs he screwed up because his drug addiction. And it was a phenomenal album. Since then, no less than three more Phenomena albums has being released, this being the fifth. But what once was a one-off project that later developed into a sequel, Phenomena now feels more like a Tom Galley’s Voices Of Rock kind of thing. And while the first two albums are great, this project feels more and more uninteresting with each album. However, Galley is too smart to release anything bad and this is no exception, even though too many songs doesn’t cut it all the way. ”The Sky Is Falling” with Mike DiMeo (Masterplan, Riot) on vocals is great. It’s a heavy tune, almost Black Sabbath like. ”I Was Gonna Tell You Tonight” with Robin Beck singing is a fantastic AOR track that sounds not so little like Heart. Robin Beck – what a fantastic singer. Still, I get the feeling that the song is a bit misplaced here. This kind of big AOR stands out like a sore thumb among the more heavy and 70’s based music. My suggestion is that Beck should record the song for one of her solo albums. ”Angels Don’t Cry” is a great melodic rock tune with vocals by Mikael Erlandsson from Last Autum’s Dream. It’s similar to ”Killing For The Thrill” from the last Phenomena album, if you have heard that one If you haven’t, then you should know that “Killing For The Thrill” was the best song off that album. And then there is ”House Of Love”, a massive power ballad with vocals by Rob Moratti, the new Saga singer. A brilliant song, maybe the best on the album and Moratti’s voice is so good it’s almost ridiculous. Wow! The other singers on the CD are Tony Martin (Black Sabbath), Chris Ousey (Heartland), Steve Overland (FM), Terry Brock (Strangeways, Giant) and Ralf Scheepers (Primal Fear). Too bad their songs didn’t make any impact at me at all. That’s the problem with the latest Phenomena releases, too many forgettable tunes. A decent album for sure, but this is light years away from the masterpiece that is the debut and it doesn’t cut it compared to II – Dream Runner (1987) either. About the Phenomena label, well that should have been dropped albums ago. Tom Galley should find a new name for his projects because this really has nothing to do with the original album. 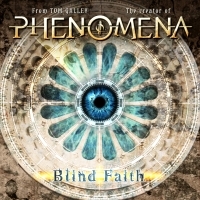 Sure, the Phenomena project nowadays has the under title “From Tom Galley – the Creator of…”, but the name Phenomena should be dropped entirely as it’s not accurate anymore. The “Tom Galley’s Voices Of Rock” is a moniker that sounds just about right. But I guess his record company believes that they can sell more copies if it’s called Phenomena. I won’t pester this issue anymore, but Galley needs to come up with an album that is at least a bit equivalent to the first albums quality wise, next time or I’m afraid he’ll be dragging the Phenomena name through the mud.